I’m enamored with the ocean, especially the aqua Pacific waters that embrace Hawaii’s palm-fringed beaches. While swimming and snorkeling in the warm clear sea, I’ve explored a lot under the water’s surface. But I’ve always wondered what views I’d discover if I could stand on top of the water as well. 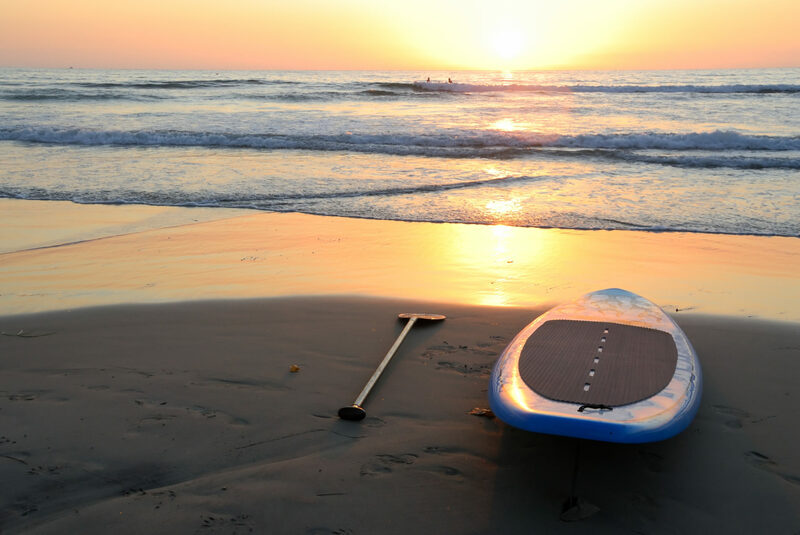 That’s why I’ve long loved the idea of stand up paddle boarding (SUP). The first time I attempted it, I was on Hawaii’s Big Island. After renting my board, I took off into the ocean, and without a second thought, I tried to stand straight up… and immediately fell down, tumbling head first into the warm sea. I hauled myself back onto my board, keeping an eye on my feet while trying to stand up again … and fell into the water, again. I’ll save you the rest of the play-by-play from my frustrating hour, but the short story: It wasn’t as easy as it looked. A few years later, I visited the gentle cove of Kapalua Bay on Maui’s north shore. Swaying palms and golden sand surrounded the protected water; nearby, kids swam, a family snorkeled, and a few happy-looking souls with whale-sized smiles stood on paddleboards surveying the scenery. I wanted in, and so did my 9-year-old son. This time, I wasn’t leaving anything to chance. I grabbed my boy for moral support and found a coach who could teach us the basics. I wasn’t a natural that second time out, either, but both my son and I were able to stand up and stay up (okay, my son was able to stay up much longer). Once we were paddling around Kapalua Bay, I realized that our success boiled down to five considerations that had completely eluded me during my previous attempt. On my first, unsuccessful attempt at SUP, I jumped into the water late in the afternoon during high tide, when the water was at its roughest. The second time around, my son and I aimed for a smooth morning on Kapalua Bay — we paddled out at low tide with no undertow. This made all the difference. 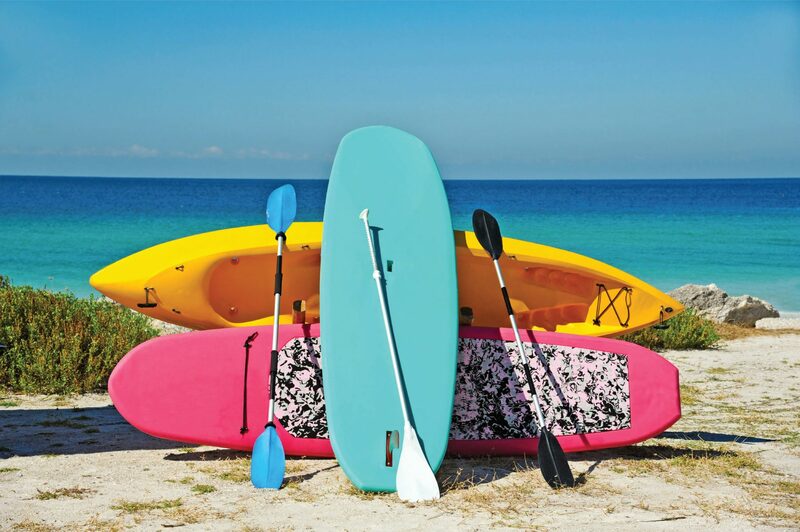 At first I didn’t realize the importance of choosing a paddle that’s the correct height for your size and paddling style. As beginners, my son and I wanted to learn general, laid-back SUP, so we were advised to select a paddle roughly 10 inches taller than our height. To easily measure, our coach had us hold our arms straight above our heads, fingertips pointed to the blue sky. In that position, the paddles came to about our wrists. Good posture is important in everyday life, but if you stand soldier-straight on a SUP — like I did on my first attempt — you’ll fall into the water within seconds. I learned to move my legs shoulder-width apart and bend my knees slightly to create a perfectly balanced position. 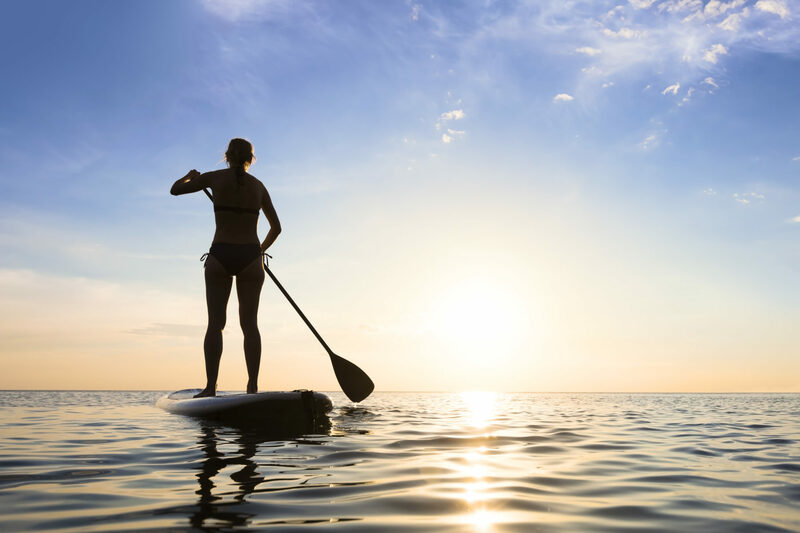 While I had thought that leg and arm strength would be most important, I discovered that paddling strength actually starts in your core — we had the most success when we kept our centers stable and strong. It paid off for us to practice on dry land first — there’s an art, it turns out, to holding the paddle correctly and balancing on the board. We also learned how to fall into the water, aiming our bodies away from the board when we lost our balance. Trust me, I wanted to keep an eye on my feet to make sure I was standing correctly. But it turns out that this was a surefire way to fall. Looking down shifted my reference point down with it, and then — splash! — I ended up in the water, again. Instead, I practiced picking a point on the horizon. When I kept my gaze level, it helped me maintain my balance. Once we had learned to stand on the board, we had to tackle the next lesson: how to paddle. Instead of going at it haphazardly, I chose one side of the board to begin paddling, and then placed the opposite hand on the top of the paddle (when paddling on the right side, my left hand was on top and my right hand was on the rubber grip). Then I positioned the paddle so that the paddle’s curve faced the board and paddle’s angled side faced toward the horizon (it won’t look right, but it’s correct, I promise). Remember I said SUP paddling strength comes from your core? 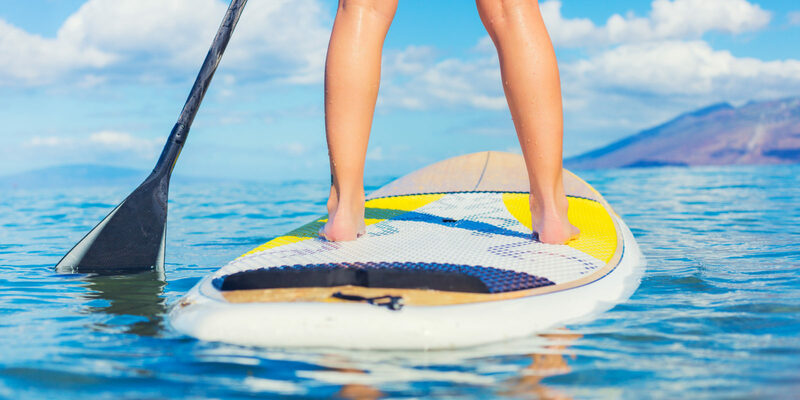 We paddled from our torso, which meant twisting from the waist up and never moving our lower body (one day, when I am a master SUP pro, I might try walking on the board and even doing yoga — really, it’s a thing! — but not today). With all of the small considerations in place, my son and I simply had to put the paddle in the water in front of our boards, and then pull back in a straight line. Once I made the first successful stroke, I could barely believe it. I took the paddle out of the water and did it again about three or four times. I switched sides, and repeated. And just like that, I was stand up paddle boarding! When you’re not working on your SUP skills, go snorkeling and explore the brilliantly colored tropical fish and coral around Maui.